If you have problems waking up or crashing in the afternoon or have dealt with a long-term chronic symptoms, you probably have adrenal fatigue and do not even know it. Pro-Adrenal is a glandular for the adrenals and helps you respond to stress better. Pro-Adrenal helps to fight fatigue and increase mental clarity by regulating the adrenal gland throughout the day using a comprehensive blend of nutrients and botanical extracts helping to promote optimal energy production, stamina, and daily stress management. Because of high paced, high stressed lifestyles and an overall lack of activity, most people suffer from adrenal fatigue because of the body’s natural response of fight or flight being activated over and over without rest or support. Have you ever had a car turn into your lane without seeing you? That skip of your heartbeat was your adrenal gland kicking in so that you can make a quick response and brake or change lanes. This response though created for emotional stress or physical danger, is activated at even minimum levels of stress loads. The nervous system sends a message to the adrenals to release adrenaline or epinephrine and norepinephrine into the bloodstream causing several bodily changes including an increase in heart rate and blood pressure. These hormones allow for quick thinking or action in order to “survive” a stress event. The problem occurs when this response is fired over and over and begins to overcompensate creating long term issues such as anxiety, anger, depression, fatigue. Most everyone needs adrenal support at some level until lifestyle changes are made that begin to diminish the overload of self-imposed stress. The adrenal glands are small glands located on top of each kidney and release hormones into the bloodstream that help to regulate bodily responses. The adrenal cortex produces three hormones: 1) Aldosterone helps maintain the body’s salt and water levels which in turn regulate blood pressure. 2) Cortisol helps to regulate the body’s stress response, regulate metabolism, assists in glucose production and has significant anti-inflammatory effects. 3) DHEA and Testosterone are also produced in the adrenal gland. Besides lifestyle stress, production of adrenal hormones can be disrupted by several factors in the environment, including heavy metals, pesticides, hormonal fluctuations, other environmental toxins, or lack of nutrients required for adrenal hormone synthesis. Pro-Adrenal is Progressive Nutracare’s comprehensive adrenal support formula and is specifically designed to support underactive and sluggish adrenal glands and regulate cortisol hormone production. If you have been suffering from long term chronic illness or are having trouble waking up or feel fatigued throughout the day, then Pro-Adrenal can help you get your life back on track. 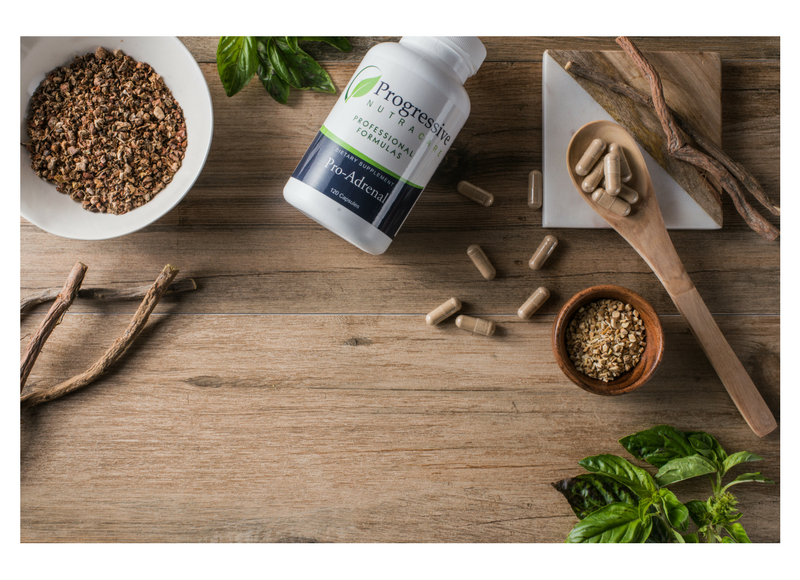 Pro-Adrenal is a physician grade formula backed by clinically relevant data to help to restore and support the adrenal glands. Avoid burnout and get a jump on maintaining a healthy weight and feeling energized and mentally sharp while regulating your stress response with Pro-Adrenal. Vitamin C is crucial for the production of epinephrine in response to stress including environmental allergens and is essential for the production and maintenance of collagen integrity. Vitamin C cannot be synthesized by humans and is therefore an essential nutrient that must be consumed in the diet. Among its numerous health-promoting properties, vitamin C is an essential vitamin that supports the immune system and is also a potent antioxidant. When the body is under a significant amount of stress, vitamin C is excreted rapidly. Vitamin C has many immune boosting properties, but is distinctively beneficial for individuals with seasonal discomfort because of its ability to deactivate histamine. American Ginseng / Panax Quinquefolius is important to include as it exhibits activities that support blood sugar already in normal range, and also supports healthy body weight, blood hormones and immune support. American Ginseng has been used for thousands of years primarily for energy production. The American Ginseng in CinnDromeX is a standardized 12% extract. Eleuthero regulates adaptogenic activity which supports the body’s ability to adapt and promote healthy stress response. Eleuthero has a balancing effect that increases stamina, mental alertness and the capability to handle daily stress. Rhodiola is an adaptogenic herb that has been used for centuries in Eastern Europe and Asia to increase stamina , maintain a healthy mood, support the nervous and immune systems as well as maintaining healthy male sexual function. Rhodiola supports neurotransmitter production including dopamine and serotonin. Other benefits include increased work performance, quality of sleep, appetite regulation and increased energy levels. Schisandra is critical for helping the body to adapt to psychological and physical stressors and affects cortisol and nitric oxide levels which promote endurance, accuracy of movement, mental performance and working capacity. Adrenal Gland derived from pure Argentinian bovine is a complementary ingredient traditionally used to rebuild and replenish adrenal function. Why adrenal extracts sourced from Argentina? These cattle are free range and grass fed without the use of growth promoting hormones, routine antibiotics, or pesticides. Sustainably and humanely raised, Argentina cattle are some of the cleanest sources in the world and free of BSE, commonly known as mad cow disease. Adrenal gland powder is a complementary ingredient traditionally used to replenish adrenal function. Licorice Root is crucial for cortisol balance and supporting adrenal insufficiency. Pro-Adrenal is a nutritional supplement intended to provide nutritional support for underactive adrenal glands. Pro-Adrenal is for individuals looking to increase energy levels, assists with mental clarity and sharpness, as well as individuals looking for assistance with healthy weight management. Pro-Adrenal is intended to take 2x daily in the morning and afternoon or as directed by your healthcare practitioners. Pro adrenal is my go to in times of stress and anxiety and depression. Great product. I Love this Product, it transformed my life! Keeps my adrenals balanced. I can tell the difference when I stopped taking my daily dose. No longer overcome by stress. This works for me. Super fast ordering and shipping! This company is tops in shipping fast and getting my products to me as promised. Quality products and delivery. I love using this product and feel it works well!